Our spacious and tranquil Wheelchair Accessible Villa is set within the picturesque Orange and Peach groves that makes the Valencia province the most beautiful in Spain. 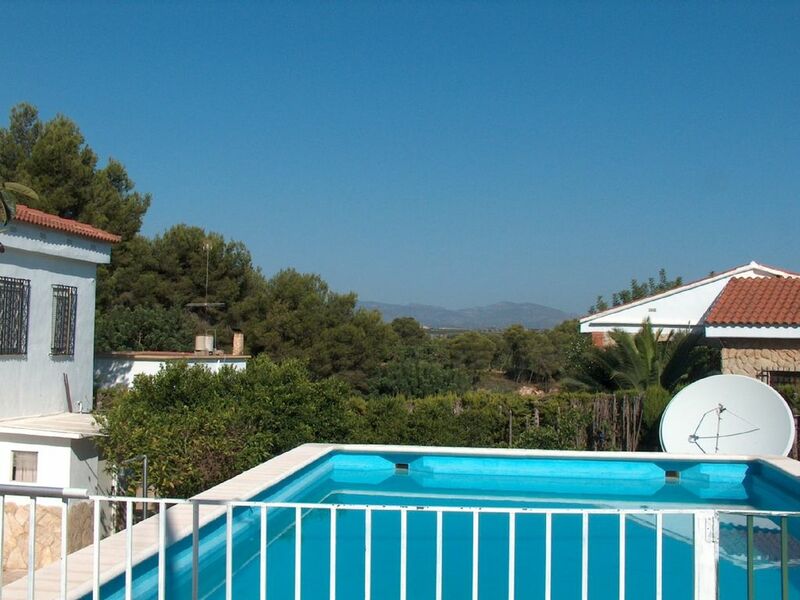 With views across the local countryside and to the nearby El Bosque Golf Course. The villa is suitable for disabled holiday makers or larger family groups. Recent renovations have included the addition of ramp access to the villa, veranda and pool area, wide doorways for wheelchair users and a disabled access bathroom. Inside, a modern fully equipped American style kitchen with dishwasher compliments a large lounge and dining area. Of the 4 bedrooms, one comes with an accessible en-suite disabled access bathroom complete with wetroom. The other three bedrooms share a family bathroom with jacuzzi bath. Outside, the swimming pool has roman steps and is fenced to be child friendly. A shaded terrace with pagoda and BBQ makes for pleasant al-fresco dining or for you to just sit and read a good book. For those who prefer to top up their tan, there is plenty of space for sun-lounging on the terrace. Pick your own Oranges and Lemons from the garden to squeeze for breakfast or for that G&T. A newly built petangue court is now also available on the property. * The Spectacular Las Fallas celebrations - Beginning on the 1st of March every year with the final nights on the 17/18/19th of March - Not to be missed! *Moto GP Valencia - Always the last and most exciting race of the year happens right here at the Ricardo Tormo circuit in nearby Cheste. Usually around the end of October or Beginning of November. over 100,000 bike fans arrive in this small market town to mark the event so beat the crowds and book early to avoid disappointment. *Football - Valencia is home to two La Liga teams, Valencia CF currently in the Champions League and Levante UD. Both teams play weekly during Autumn, Winter and Spring. Villa features full wheelchair and disabled access with wide doorways, ramp access into the villa and around pool. Plus a fully fitted disabled access bathroom with handrails, sit-in shower/wetroom and raised toilet. Smoking allowed in outdoor areas of the property. Fans and heaters throughout and open fire in lounge for winter time. Secure Garage Parking. From the start of the booking enquiry to leaving after our holiday there was absolutely no problems whatsoever. The pictures on the website do not do this lovely spacious property justice. John, the lovely the owner could not be more helpful. He offered to pick us up and when we said we were hiring a car he met us at the airport and we followed him back to the home in our car. The house has a lovely homely feel to it, there is plenty of everything, bedding, towels, crockery, kitchen items, a large fridge and freezer, washing machine and washing lines. The house is in a very quiet residential area, the huge terrace, patio area and pool are along the front of the house. While we were there (for 7 days in September) I think we only saw 2 or 3 people passing the property. One of the party had mobility issues (using crutches and wheelchair) and the property was ideal. There is a wet room with shower, no curb from the road at the front and ramp up to the front veranda. There is a tiny step (only 1cm) over the front door frame but that was easily negotiated. We were hoping for a peaceful week doing very little and that is exactly what we got. We rarely ventured out although did have a trip into Valencia (an easy 20 min journey) and this is a lovely city. The closest bar/ restaurant (which we didn't visit) and supermarket (this is excellent, it's well stocked, has bakery, fresh fish and meat counters) is less than 5 mins drive but not really walkable so I think a car is necessary. There was nothing at all to fault about the place 10/10 for the property and 10/10 for John. I would highly recommend this place and would love to return sone day. We arrive at the villa as a family of 9. The villa was up to expectations, it was clean and well maintained. The owner provided good costumer service and very welcoming. The pool was refreshing and well kept. It is very welcoming and convenient for big families. I would recommend hiring a car for your visit but if not, there are plenty of places for hire. They had many attractions there such as Arts and Sciences Museum, Bullfighting (very exciting), the beach and much more. There are many restaurants around if you do not want to cook all the time or would like to try some Spanish cuisine. There were many near by shops which you could do shopping (eg. Lidl or comer). Overall, it was an amazing experience, I would definitely recommend this villa and I would go again. We could not recommend this Villa highly enough, thoroughly enjoyed our stay and loved the get-away-from-it feel of the property. Hopefully we will be able to stay again on our next holiday and explore the local area even more. Very clean and well kept, lovely pool and terrace area and beautiful surroundings. Would recommend having your own transport but this wasn't a problem for us and the local train goes straight to the heart of Valencia! Thank you Villa Mariposa for a very memorable holiday... for all the right reasons! We had a wonderful time at this Villa, everything was perfect for our family getaway. The closeness to Valencia city was a real plus for us especially as we could use the local train service to save us the drive but the villa is in very tranquil surroundings which makes it a great place to relax too! We will definatly be booking again next year, can't wait! I would recommend this beautiful villa for its location and facilities. It is well maintained, comfortable and the cleanliness is second to non. The owners John and Judy are extremely helpful and make it there business to ensure you have a good holiday. The location was perfect for its tranquillity and convenient for the local amenities. Although I would recommend you hire a car, it is not essential as there is a local bus and the taxis aren't expensive. I am certainly going back if there is availabilities. Hemos estado una semana toda la familia, las fotos no hacen justicia a lo bonita que es la casa, y la tranquilidad de la zona. Un lugar para ir a descansar y desconectar. La piscina genial, siempre ha estado a 30 grados, y la barbacoa, uffff, una pasada. Además John y Brenda son muy amables, nos atendieron en todo lo que necesitamos. Además la casa esta a solo 20 minutos de Valencia, muy bien comunicada, y tienes un super a 5 minutos. The villa nestles in a small quiet urbanisation that overlooks the famous el Bosque Golf Course near Valencia, but only 10 minutes away from the A3 motorway. This makes it ideally situated for the drive to Coast with it's long stretches of sandy Beaches, or into the important and Historic city of Valencia itself. The Ricardo Tormo Racing Circuit in Cheste is only a short drive away, along with the Bonaire shopping centre, just outside Valencia, which offers bowling, restaurants, cinemas, and massive shopping outlets. On the otherhand, If you fancy a relaxing Picnic or a quiet Day Trip, the spectacular Albufuera nature reserve is situated only 25-30 minutes away. Also don't forget that Valencia hosts many Sporting events, such as Moto GP, ATP Tennis, and La Liga football. Other Activities: Short drive to beach. Petangue Court newly built on property. Golf: El Bosque Golf Course entrance situated less than 5 minutes away by car.